I swear it was about 5 minutes ago that I was typing up our travel update for the first quarter of 2018. Here I am, in July already, thinking back to the incredible adventures we’ve enjoyed from April through June. 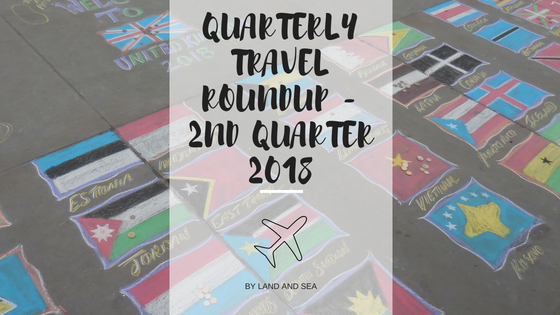 These quarterly posts highlight our travel activities by offering glimpses of things that haven’t made it onto the blog yet! As you may remember, at the end of March we hit the road for a trip which we were mostly keeping secret until this particular travel roundup was published. The destination? Europe! We have really been wanting to spend more time exploring Europe, and recently found we are able to get here with more ease and better prices than many North American destinations we have been frequenting. It was a great experience – one that we will truly remember! We visited many wonderful places in Europe! Posts coming to the blog soon! Just because I took the month of May off from blogging for my birthday, doesn’t necessarily mean we took the month off from our travel activities. My hubby surprised me with a wonderful birthday/grad school gift – a trip to San Antonio, Texas! We have looked at visiting here several times, and it finally worked out. I’m not even sure of the right words to describe what this gift meant to me and how exciting this was for me! Typically, we travel very little during the peak summer months. The weather at home is beautiful, the activities are plentiful, and its my husband’s busy season at work. On top of that, we were both deeply buried in school during June as well. However, we made sure to spend some time planning our next round of upcoming travels, including our very special five year wedding anniversary celebration! Something else remarkable happened in the second quarter of 2018. I finished my last two subject matter classes of my degree program! All I have to do now is apply everything I’ve learned over the last 2 years into my final project. Wish me luck as I get ready to submit this, finally earning my Master of Sustainable Tourism degree! I was very excited to finally get some affiliate marketing up and running in the second quarter of the year. If you’re looking for hotel recommendations, I created an entire page full of places where we have enjoyed our stays. What a handy resource! Check out this page as well as our other recommended travel products and related links! We truly appreciate any hotel bookings made through us, or purchases through our other affiliates! It helps offset the costs of running this blog, at no extra cost to you! I’ve also been working on upping my social media plan and the dreaded GDPR requirements! Beginning in August 2018, I will be changing our posting schedule! Currently, new posts are coming out on only twice per each month. However, as school is wrapping up and I’ll have a bit more free time on my hands, I am now able to post a tiny bit more often! It won’t be a huge increase – let’s face it, this is still a part time travel blog. But, readers can look forward to some great travel content coming soon to the blog! I am also working on sharing more of our personal travel photos and experiences on social media. This is a big step for me! What did your last three months of travel bring? Please share your fun experiences with us in the comments below! I just did this last week as a mid-year review! It’s great seeing all the places you’ve been and all the places yet to go! It makes me excited for the rest of 2018. Congratulations on your degree! How exciting to wrap that up! I’m looking forward to your posts on your Europe trip! Amazing what you can do with a year!! My favorite pic is the Alamo. Also think it is very cool you have provided options for more affordable hotels. I do not know many people who can work full time, earn a Master’s Degree, and travel the world all at the same time! I congratulate you to your Master of Sustainable Tourism and your brave decision to take such a extensive study on. 10 years ago I finished my MBA in Tourism. It was a lot of work but also fun to learn. Keep spirits up!